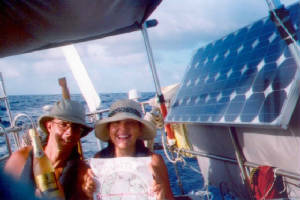 After the Canaries we headed south for a rough, fast crossing in the NE Trades to the Cabo Verde Islands. It was interesting to visit these remote islands, but depressing to see how poor the people are and how little they have not even water in some places. After entering at Isla de Sal (very poor, dry and barren) we went to Boa Vista (windy) then Tarrafal in Sao Tiago (green and mountainous, good diving, dangerous minibus taxis) and finally the tiny port on the circular volcanic island of Fogo (spectacular scenery, good spearfishing). Our good friend Nig came to visit in this time and we had a great time. Our next destination was Brazil and crossing the equator was a milestone. Carrying a bowl of coconuts is harder than it looks! 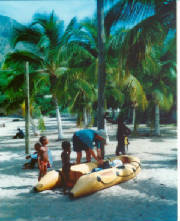 Poor, friendly kids "helped" us daily to get ashore.